Many of those who have kept Gouldian Finches maintain that there is perhaps no greater joy than keeping a Gouldian Finch. Like other finches the Gouldian has a beautiful chirping voice. It should be noted that singing is seen in males not females. The Gouldian Finch is a social creature, but more social with birds than people. They do not generally like to be held or petted, as is the case with most finches. If you are looking for a bird that enjoys physical human contact this is not the species for you. Because they are social creatures it is recommended they not be kept singly but rather in pairs or groups of pairs. Gouldian Finches do not adapt well to change and may become highly stressed when their cage or environment changes. Frequent stress of this variety can kill them because it lowers their resistance to disease. Gouldian Finches are active birds, but are less active than some other types of finches. The Gouldian Finch is also known as the Painted Finch or Rainbow Finch because of its striking colors and pattern. A small bird, the Gouldian Finch weighs approximately 15 grams at maturity. Naturally occurring Gouldian Finches in the wild are seen in three specific color patterns, with head colors of orange (also called the yellow form, this form is very rare), bright red or black (the most common form). Body colors of olive green with purple chest patches and yellow underbellies are common to all three. For domestic Gouldian Finches the body colors of Gouldian Finches can come in a wide array of colors which are distinct and well separated from other colors on the Gouldian. 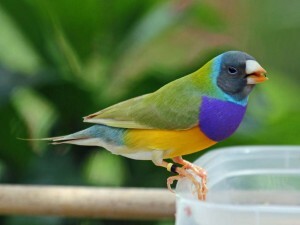 The typical Gouldian Finch will exhibit a deep violet chest, neon blue rump, neck and upper tail, black pintail and yellow belly. It must be noted that immatures and females are duller and more washed out than the brilliantly colored males. This is not to say that the females are also not beautiful. Their distinctive pastel colors are also quite stunning. There are many different color possibilities available in today’s domestic Gouldian Finch. The one requirement is that colors remain clear and distinct. 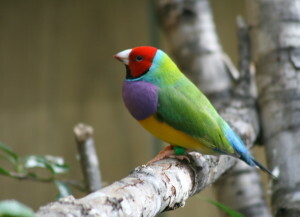 For example several breeders have bred Gouldians that have retained the bright red face but exhibit yellow backs and bright white chests, or white bellies with blue wings, back and necks. 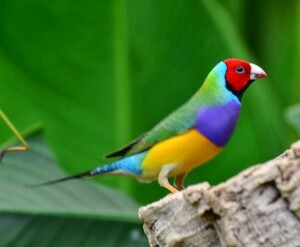 The Gouldian Finch originates in Australia. Its natural habitat is difficult to access and is also quite limited. John Gould was the first to describe this beautiful bird. Mr. Gould was so taken by the breed that he originally named it after his wife. Since then it has been renamed to its current name ‘Gouldian Finch’. There appears to be some inconsistency in the scientific classification of the Gouldian Finch. In some places they are recorded as ‘Chloebia gouldiae’ and others as ‘Erythrura gouldiae’. It appears that both are accepted, but this dual scientific nomenclature is unusual. The Gouldian Finch is an endangered species; with only 2,500 mature adults existing naturally in the world, this is surprising because they were at one time one of the largest flock birds in Australia. The reasons for its decline are numerous one of the clearest reasons is destruction of its habitat due to poor land management and land use, additionally they are susceptible to respiratory infections in the wild caused by an endoparasitic mite. Efforts are being made to save this beautiful bird from becoming more endangered or extinct. Caring for Gouldian Finches is not as easy as some of the “novice finches” such as the Zebra Finch and the Society Finch, but Gouldian Finches may have an undeserved reputation for being difficult to care for. While it is true that the Zebra and Society finch may be more hearty, Goudians are also quite hearty if they are bred from good stock. Generally speaking many Gouldian Finches do not handle change well. They should not be moved around frequently or they become highly susceptible to disease due to increases in stress levels. It is important that owners take care to make sure that temperatures are kept within reasonable ranges for the Gouldian Finch. Gouldians can accept temperatures as low as 40 degrees Fahrenheit but as is true with other animals they must be acclimated and receive a well balanced diet to withstand extreme low temperatures. 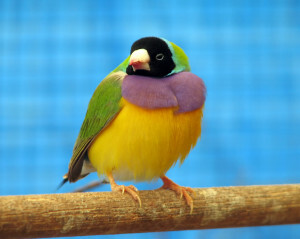 Gouldians will breed at temperatures as low as 55 to 60 degrees Fahrenheit, and some hobbyists report that theirs will breed in lower temperatures. Ideal temperatures range between 70 and up to 75 degrees Fahrenheit. High humidity requirements is an matter of “opinion” among hobbyists and can be adjusted by allowing a Gouldian to have access to a bath, or by spritzing a few times a day after the 1st week of incubation. The egg or any birds egg for that matter does require some humidity which is drawn by the moisture from the air and/or the parent’s breast while the parent incubates. As with all pet birds natural sunlight is a must. If this is not possible you can use artificial full spectrum florescent lighting. The Gouldian, like other finches must be allowed room to fly. For this reason cages should not be smaller than 20X20X40, to allow plenty of room to fly. A balanced diet is also a must. This diet should consist of seeds including, canary grass seeds, Niger seeds and other seeds, millet, fresh greens such as chickweed, dandelion, parsley and spinach. In addition some Gouldians may enjoy fresh insects such as crickets, waxworms, fruitflies and mealworms. Most captive bred Gouldians, however, do not eat live foods. If you want your Gouldian to accept live foods they should observe other Gouldians eating them. Gouldian Finches do need an increase of protein in their diet during the breeding season, which is usually provided by feeding them an eggfood mixture, which also serves as a good food for the nestlings–and is especially valuable for them in their first few days after hatching. It is very important that any who wish to purchase these birds learn as much as possible about their special care requirements prior to purchase. Breeding Gouldian Finches is generally considered more difficult than breeding the more prolific Zebra Finches and Society’s. 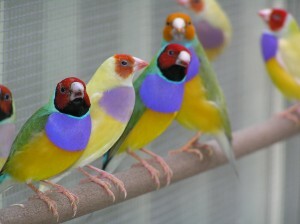 Gouldian Finches are not generally considered a good first choice for a novice finch breeder. Novices may want to attempt to breed another type of finch to gain experience and should make sure to educate themselves before attempting to breed them. Incubation for Gouldians is between 14 and 19 days. The hen will start to incubate after the last egg is laid then start counting your days. Sometimes the male will participate or take over incubation. This varies. Usual clutch sizes is between five and six eggs. Eight eggs is extremely unusual. Coloring up or molting completely out takes from eight months to one year. Some Gouldians may have difficulty learning parenting skills, but often get things right after an attempt or two that fails somewhere along the line–and thereafter can be excellent parents.